New Balance 1500 v1 are stability racing running shoes. The New Balance 1500 v1 is a brand new model from Boston's brand where speed meets support. With just 6 mm drop it features a perfect blend of lightness, stability and responsiveness, kind of 1400 v2 with motion control. Targeting triathletes, it was introduced to general public when Sebastian Kienle won the Ironman World Championship in Hawaii on October 2014 after running the marathon on a pair of it. 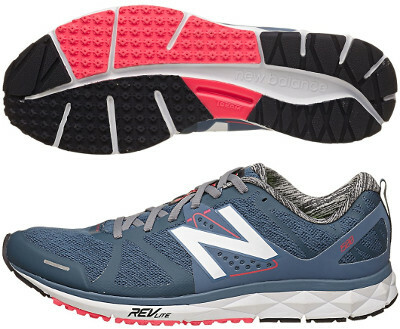 Although the 1500 v1 is a really light shoe, it provides mild over pronation correction based on higher density foam in the midfoot while additional arch support and torsional stability are powered by light, flexible TPU shank (T-Beam) in the midfoot. Cushioning relies on full length of light and responsive REVlite foam which is already well known from other popular shoes from the american brand like the 890 v5. Upper is based on a seamless breathable air mesh with fused synthetic overlays (FantomFit) strategically placed for better fit. The N logo is the biggest reflective element in order to enhance visibility under poor light conditions. No friction at all so ready for barefoot running.